The Japanese beetle, Popillia japonica, is considered the single most important turfgrass-infesting pest in the United States. It was first discovered in the U.S. in southern New Jersey in 1916. Japanese beetles occur in every state east of the Mississippi River except Florida. The insect’s spread is apparently governed by temperature and precipitation. The beetle is adapted to a region where the mean summer soil temperature is between 64° and 82°F and winter soil temperatures are above 15°F. Also, beetles thrive in areas where precipitation is rather uniform throughout the year, averaging at least 10 inches during the summer. Description: Japanese beetle adults are slightly less than 1∕2 inch long, and are shiny, metallic green. They have coppery-brown wing covers that do not entirely cover the abdomen. There are six pairs of patches of white hairs along the sides and back of the body, under the edges of the wings. Males and females have the same markings, but females are typically slightly larger. Newly hatched larvae are approximately 1∕8 inch long and a translucent, creamy white. Once feeding begins, the hindguts of larvae appears gray to black. 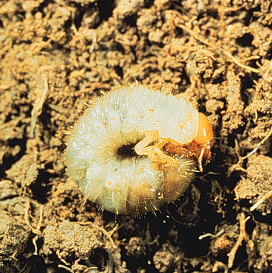 The typical C-shape of Japanese beetle larvae is similar to that of other white grub species. Plants Attacked and Damage: Japanese beetle adults do not damage turf, but are an important pest of many other plants. They feed on foliage or flowers, and are a major pest of over 350 species of plants, including fruits, vegetables, ornamentals, field and forage crops, and weeds. Norway and Japanese maple, birch, crabapple, purple-leaf plum, rose, mountain ash, and linden are highly preferred ornamental hosts. Adults feed on the upper surface of the foliage of most plants, consuming soft tissues (mesophyll) between the veins, and leaving a lace-like skeleton. Often the upper canopy is defoliated first or most severely. Trees with extensive feeding damage turn brown and become partially defoliated. Japanese beetle grubs feed below ground and chew on the roots of turf and ornamentals. As a result, they reduce a plant’s ability to take up enough water and nutrients to withstand stresses of hot, dry weather. The first evidence of grub injury in turf is the development of localized-patches of pale, dying grass that displays symptoms of drought stress. As grubs develop further and feeding increases, damaged areas rapidly enlarge and coalesce (merge) to a point where the turf is not well-anchored and can be rolled back like carpet. Life Cycle: Japanese beetles have only one generation per year. In mid-June or around 1000 growing degree day units, adults begin emerging from the soil. Immediately thereafter, females mate with males and begin laying eggs. Adult beetles are most active in the afternoon in full-sun. Females leave ornamental plants where they feed and mate, and burrow two to four inches into the soil (under the turf and in mulched areas) in a suitable area to lay their eggs. Eggs hatch in about two weeks, after which grubs begin feeding on the roots of turfgrass and ornamental plants. The grubs grow quickly, and by late-August are nearly full-grown (about one inch long). Mid-summer rainfall and adequate soil moisture are needed to prevent eggs and newly-hatched grubs from drying out. Adult females instinctively lay their eggs in areas with higher soil moisture content to ensure survival of their offspring. Older grubs are more drought-tolerant and will move deeper into the soil if conditions become dry. Grubs can also withstand high levels of soil moisture, so excessive rainfall or irrigation will not affect them. As soil temperatures cool in the fall, and the first meaningful frost occurs, grubs begin to move deeper into the soil. Grubs overwinter in the soil about two to six inches below the surface, although some may be a deep as 20 inches. They become inactive when soil temperatures fall below 50°F. In the spring, when soil temperatures reach 50°F, the grubs begin to move up into the root-zone to resume feeding for about three to five weeks. Thereafter, the grubs stop feeding and begin creating an earthen cell where they pupate (i.e., transform) into adults. Control: Both the adults and grubs of Japanese beetles cause damage. Thus controlling one life stage will not preclude potential problems with the other. Control options for each life stage are presented below. Physical removal and trapping of adults: Removing beetles by hand, or trapping, may provide adequate protection for small plantings when beetle numbers are low. However, Japanese beetle adults are capable of migrating from other areas, and the presence of beetles on or near a plant will attract more beetles. Consequently, use of Japanese beetle traps often attracts more beetles, and results in subsequent damage to plants. Chemical Control of Adults: Several insecticides are labeled for use against adult Japanese beetles. Always follow label directions. Treat foliage and flowers thoroughly. For optimal control, apply in the afternoon when beetles are most active. 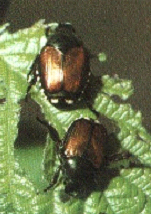 Cultural Control of Grubs: Because Japanese beetle eggs and young grubs have difficulty surviving in relatively dry soil conditions, withholding irrigation during peak adult beetle flight may help to reduce grub populations. However, adequate soil moisture in late-August and September can help damaged turf recover from grub damage. Biological Control of Grubs: Although there are a few biological control products that allegedly control Japanese beetle grubs, the performance of these products has been inconsistent. Biological control products include milky spore disease, insect-parasitic nematodes, and fungal pathogens such as Beauveria bassiana and Metarrhiizium. Chemical Control of Grubs: Nearly all soil insecticides provide adequate control of Japanese beetle grubs. However, not all control products perform equally. The traditional approach has been to apply short-residual products after eggs have hatched, but before grubs cause visible damage. This approach is termed “curative” control. The optimal timing for curative treatments is early to mid-August. Carbaryl (Sevin), clothianidin (Arena) and trichlorfon are three active ingredients that all provide meaningful curative control. Preventative insecticides are another effective management option that is typically preferred over curative insecticides due to greater level of control and a larger application window of time, May to July, due to their longer residual activity. Preventative insecticides are best applied prior to egg lay typically early July. Preventative products contain the active ingredients imidacloprid, chorantraniliprole, clothianidin and thiamethoxam. For more information on Japanese beetle: See UW-Extension bulletin A3597 and A3714, or contact your county Extension agent. Thanks to Karen Delahaut and Phil Pellitteri for reviewing this document.